A tiny space rock barely missed Earth on Thursday in the third of back-to-back-to-back asteroid flybys over the past 24 hours, coming six times closer than the orbit of the moon. 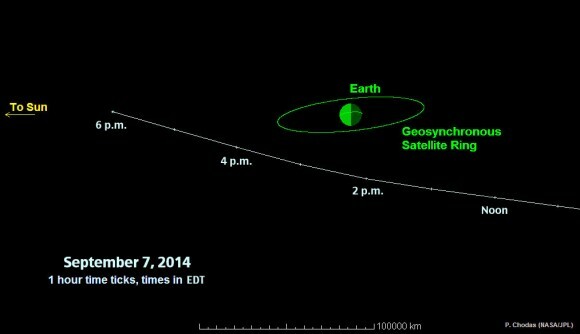 The 25-foot-wide (8-meter-wide) asteroid 2014 EC came within 38,300 miles (61,600 kilometers) of our planet at 4:21 p.m. ET, NASA officials said. For comparison, the moon orbits Earth at an average distance of 239,000 miles (385,000 kilometers). But Thursday's close encounter was special in one sense — it came just one day after two other space-rock flybys. On Wednesday afternoon, the 100-foot-wide (30-meter-wide) asteroid 2014 DX110 zipped within 217,000 miles (350,000 kilometers) of Earth. "A third asteroid, 2014 EF, which is closer in size to today's 2014 EC, passed Earth at about 7 p.m. PST (10 p.m. EST) Wednesday, with closest approach about twice as far from Earth as 2014 EC's closest approach," NASA officials wrote in an update Thursday. There was never any danger of an impact by the asteroids during these flybys, researchers said. 2014 EC was just discovered on Tuesday night. It's about half as wide as the space rock that exploded without warning over the Russian city of Chelyabinsk in February 2013. The rings of Saturn are among the crown jewels of our solar syste, but it turns out that asteroids can have rings of their own, too. Here: See an artist's view of the rings surrounding the asteroid Chariklo, which is only 155 miles (250 kilometers) across. The asteroid is the first non-planetary body in the solar system discovered to have its own ring system. Image released March 26, 2014. This ESOcast shows how observations at many sites in South America, including ESO's La Silla Observatory, have made the surprise discovery that the remote asteroid Chariklo is surrounded by two dense and narrow rings. This is the smallest object by far found to have rings and only the fifth body in the Solar System — after the much larger planets Jupiter, Saturn, Uranus and Neptune — to have this feature. The origin of these rings remains a mystery, but they may be the result of a collision that created a disc of debris. Robertson may be wrong, but scientists say it's pretty much just a matter of time! COME ON ASTEROID HUNTERS!! Don't make any long term plans, because next week the earth is going to be destroyed by a gigantic asteroid. That's the gloomy prediction of US televangelist Pat Robertson, who made the announcement on his TV show. Robertson believes Jesus prophesied this Extinction Level Event (ELE) and urges the public to buy his book, "The End of the Age", to find out more. "I wrote a book," he says. "It deals with an asteroid hitting the Earth. I don't see anything else that fulfills the prophetic words of Jesus Christ other than an asteroid strike. There isn't anything that will cause the seas to roil, that will, you know, cause the skies to darken, the moon and the sun not to give their light, the nations terrified on Earth of what's happening." Interestingly, Robertson also claims an asteroid wiped out the dinosaurs – though how this squares with his Creationist beliefs is unclear. And, while astronomers have not issued any warnings of imminent world destruction, they do now believe the earth is struck by large asteroids far more frequently than was previously thought. At a conference at Seattle's Museum of Flight last week, three astronauts presented data showing the surprising regularity of large asteroid strikes. US Shuttle and Soyuz Astronaut Dr. Ed Lu, NASA Astronaut Tom Jones and Apollo 8 Astronaut Bill Anders revealed that since 2000 a total of 26 nuclear-sized explosions have occurred on earth as a result of asteroid impact. Their explosive energy ranged from 1-600 kilotons. One of the most notable was the asteroid strike at Chelyabinsk, Russia in 2013 which injured over 1,200 people. The bomb which destroyed Hiroshima in 1945 was 15 kilotons. "While most large asteroids with the potential to destroy an entire country or continent have been detected, less than 10,000 of the more than a million dangerous asteroids with the potential to destroy an entire major metropolitan area have been found by all existing space or terrestrially-operated observatories. Because we don't know where or when the next major impact will occur, the only thing preventing a catastrophe from a 'city-killer' sized asteroid has been blind luck." Towards the end of his broadcast, Robertson – who has past form when it comes to making doomsday prophecies - appears to backtrack somewhat from his eye-catching claim that the earth will be wiped out next week. "It could be next week, it could be 1,000 years from now. But nevertheless, we want to be ready whenever the Lord says, 'I'm wrapping it up, and it's time to come home.'" Whenever a massive asteroid lines a city up in its crosshairs — and it's just a matter of time before this happens if humanity doesn't take some defensive measures, experts stress — a few rubberneckers are bound to ignore evacuation orders and head toward the impact site to get an eyeful of a once-in-a-lifetime event. "So that would be a concern, and that's probably something that emergency management folks need to consider when they write their playbook of what they would do," Boslough said Thursday (June 5) during a webcast produced by the online Slooh community observatory that discussed the 1,100-foot-wide (335 meters) asteroid 2014 HQ2014, which some observers nicknamed "The Beast." "The Beast" flew harmlessly by Earth on Sunday (June 8), missing us by 777,000 miles (1.25 million kilometers) — more than three times the distance between our planet and the moon. While there was never any danger of an impact on this pass, 2014 HQ2014 would have done serious damage if it had slammed into a populated area. The asteroid could have destroyed an entire city, Boslough said, creating a crater 3 miles (5 km) wide and breaking windows 62 miles (100 km) from the impact site. Radar observations as "The Beast" got closer would have enabled researchers to predict its impact location to within 0.6 miles (1 km) and its impact time to within 1 second, he added. This information, of course, would be of great interest to emergency-management personnel and rubberneckers alike. What’s your vision for solar system exploration? And how cool would it be to send it literally into the solar system? NASA is offering its fans the chance to compose a tweet or send a picture showing how we can step out into the cosmos. The best ones among these will be placed aboard a spacecraft that will zoom to an asteroid in 2016. The “time capsule” will be placed aboard the Origins-Spectral Interpretation-Resource Identification-Security-Regolith Explorer (OSIRIS-REx). If all goes to plan, it will meet with the asteroid Bennu in 2019, pick up a sample and then return it to Earth in 2023. And by the way, you can also send your name to Bennu via this form (a joint initiative of NASA and the Planetary Society.) Seems a good chance to get your name off of Earth, until the time when space travel becomes affordable to ordinary citizens. For more details about the tweets and images time capsule, visit this NASA website. Make sure to submit your message before Sept. 30. NEOs or Near Earth Asteroids are defined as space rocks that come within about 28 million miles of Earth’s orbit. Nearly once a month astronomers discover an Earth-crossing asteroid that passes within the moon’s orbit. In spite of hype and hoopla, none has threatened the planet. As of February 2014, we know of 10,619 near-Earth asteroids. It’s estimated that 93% of all NEOs larger than 1 km have been discovered but 99% of the estimated 1 million NEOs 100 feet (30-meters) still remain at large. No surprise then that new ones pop up routinely in sky surveys. Take this past Sunday night for example, when the Catalina Sky Survey nabbed 2014 RA, a 20-foot (6-meter) space rock that whistled past Earth that evening at 33,500 miles (54,000 km). It’s now long gone. WAIMEA, Hawaii — In the 1998 movie "Armageddon," an asteroid the size of Texas threatens to collide with Earth in 18 days. To save the planet from destruction, a ragtag team of deep-sea oil drillers volunteers to divert the massive space rock by burying a nuclear bomb beneath its surface and blasting it into two pieces that will fly past Earth. But despite its entertainment value, the film is fantastically inaccurate, said astronomer Phil Plait, who writes the "Bad Astronomy" blog on Slate.com. During his talk, Plait showed a clip from "Armageddon" in which Bruce Willis' character struggles to detonate the bomb, by hand, before the asteroid smacks into Earth and destroys all life. "There are more mistakes in that clip than video frames," Plait said. In order to blow up an asteroid the size of the one in the film, the bomb would have to explode with the same amount of energy as that produced by the sun, he said. Even if you could make such a weapon, "it would be way more dangerous than the asteroid itself." What's more, now you don't just have an asteroid — you have a radioactive asteroid, he said. But while real-life science in "Armageddon" fails miserably, you can find much more accurate science in the similarly plotted film "Deep Impact," also released in 1998, Plait said. In that movie, a teenage amateur astronomer discovers a 7-mile-wide (11 kilometers) comet on a path that will smash into Earth in two years. As in "Armageddon," humanity sends a team of people to the space rock to destroy it with a nuclear weapon, but this time, the blast needed is much smaller, and the fragments produced by the explosion still end up heading for Earth. One of the pieces plunges into the Atlantic Ocean, generating a mega tsunami that floods Manhattan and many major coastlines, a scenario that is actually pretty accurate, Plait said. But even "Deep Impact" gets some things wrong. The asteroid mission sends a spaceship to blow up the other comet chunk, producing fragments that burn up harmlessly in Earth's atmosphere instead of causing deadly impacts — not a very likely scenario, Plait said. NASA’s current asteroid-redirect mission plan calls for a robotic probe to capture a small asteroid (or one boulder from a large space rock) in deep space and tow it back to lunar orbit, where it would be visited eventually by astronauts. But another proposal advocated in an October 2014 editorial in the journal Nature would fly a crew directly to a near-Earth asteroid, or NEA, in its native orbit. If the ultimate goal is a mission to Mars, a NEA in its native orbit provides more experience in operating long-duration missions in deep space, says the editorial's author, MIT professor Richard Binzel. NASA’s proposed asteroid redirect mission would not take crews much farther than they’ve already been: the moon. A manned flight to a NEA would take weeks or months, as opposed to NASA's redirect plan, which would only involve astronauts flying in space for days. The first step toward visiting a NEA should be undertaking a comprehensive search for close-flying space rocks, Binzel says. Such a survey would find thousands of potential astronaut destinations that could serve as "stepping stones" to Mars, and would also identify many space rocks that could pose a threat to Earth down the road. Asteroids are small, airless rocky worlds revolving around the sun that are too small to be called planets. They are also known as planetoids or minor planets. In total, the mass of all the asteroids is less than that of Earth's moon. But despite their size, asteroids can be dangerous. Many have hit Earth in the past, and more will crash into our planet in the future. That's one reason scientists study asteroids and are eager to learn more about their numbers, orbits and physical characteristics. If an asteroid is headed our way, we want to know that. Most asteroids lie in a vast ring between the orbits of Mars and Jupiter. This main asteroid belt holds more than 200 asteroids larger than 60 miles (100 kilometers) in diameter. Scientists estimate the asteroid belt also contains more than 750,000 asteroids larger than three-fifths of a mile (1 km) in diameter and millions of smaller ones. Not everything in the main belt is an asteroid — for instance, comets have recently been discovered there, and Ceres, once thought of only as an asteroid, is now also considered a dwarf planet. Many asteroids lie outside the main belt. For instance, a number of asteroids called Trojans lie along Jupiter's orbital path. 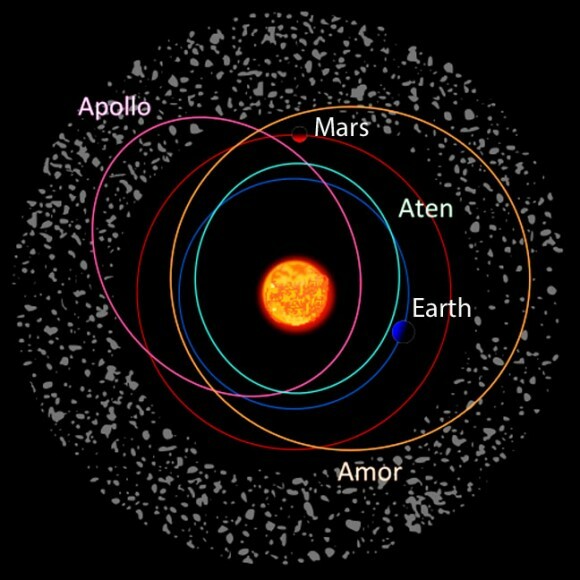 Three groups — Atens, Amors, and Apollos — known as near-Earth asteroids orbit in the inner solar system and sometimes cross the path of Mars and Earth. Leading experts in astronomy, cosmology, physics, and entertainment will hold a simultaneous press conference in London and San Francisco on December 3 to announce Asteroid Day — a global day of awareness to educate the world about asteroids: what they are, how frequently they impact Earth, and how we can protect our planet and humanity from potential disasters. 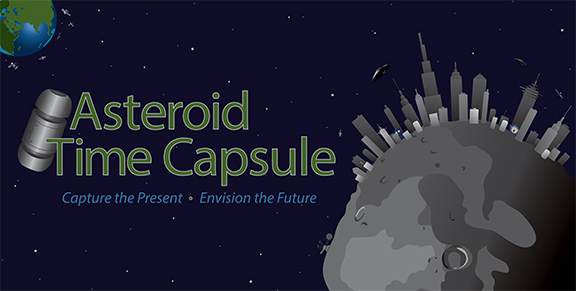 Asteroid Day will be held June 30, 2015, with events around the world hosted by individuals and organizations, at schools, museums, community and science centers, via film and entertainment. Also to be released at the press conference will be a 100x Asteroid Declaration, signed by noted scientists, business leaders, educators, and entertainers. The declaration calls for the rapid hundredfold acceleration of the discovery and tracking of near-Earth objects (NEOs). The UK and U.S. press conference will be linked via video between the London Science Museum and California Academy of Sciences. 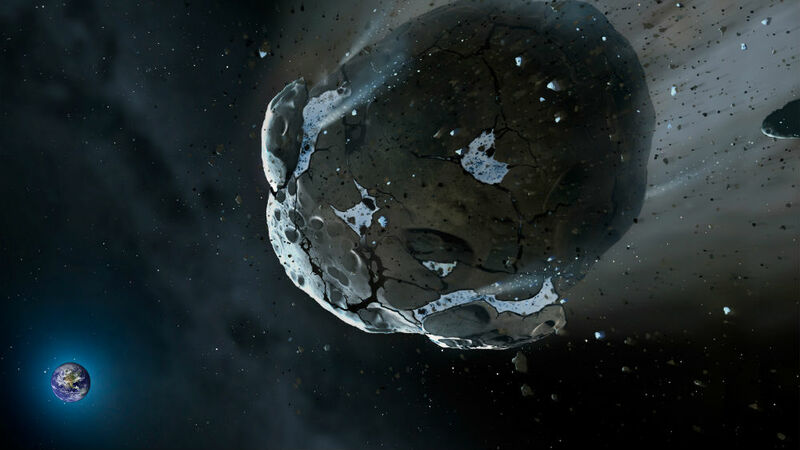 An artist's depiction of a hazardous near-Earth asteroid. That's the main message of "Asteroid Day," an educational campaign that launched today (Dec. 3) at a joint news conference held both here at the California Academy of Sciences and in London. Asteroid Day aims to raise awareness of the threats posed by space rocks and eventually help boost the rate of near-Earth asteroid discovery by a factor of 100. The campaign wants the world to mark Asteroid Day on June 30, 2015, the 107th anniversary of the "Tunguska event." On June 30, 1908, a near-Earth object (NEO) thought to be about 130 feet (40 meters) wide exploded above the Podkamennaya Tunguska River in Siberia, destroying 800 square miles (2,072 square kilometers) of forest. "If that event had taken place 6 1/2 hours later, Berlin would have rotated into the object's path, and that would have utterly changed the course of human civilization," said Bill Nye, former TV "Science Guy" and CEO of the nonprofit Planetary Society, who joined today's news conference via videoconference from New York. A series of events organized by individuals and groups around the world will take place on June 30 of next year to mark the anniversary, Asteroid Day organizers said. The threat from comets and asteroids hit a fever pitch last year after the Chelyabinsk meteoroid exploded over Russia, injuring thousands and causing property damage (such as blown-out windows) www.universetoday.com/109376/happy-1st-anniversary-chelyabinsk-the-fireball-that-woke-up-the-world/ . The incident caused NASA, the European Space Agency and others to express a renewed commitment in watching these interluders from Earth. Back when NASA first floated the idea of an Asteroid Redirect Mission, the general reaction was to scoff. NASA’s willing to talk about some pretty out-there ideas these days, from space elevators to warp drives, and it was assumed that this was just another really-really-well educated guess at something that might not be possible until four or five iPhone generations from now. But NASA doggedly insisted that this was a real possibility, kept on that their planning was concrete, their timelines solid. What began as a mission to grab a deep space asteroid and haul it into Earth orbit was side-graded to become a mission to divert a much smaller near-Earth asteroid into a Lunar orbit. Well, on Thursday NASA’s Lindley Johnson said that the agency doesn’t even see asteroid redirection as a firm requirement for success, seeming to try to prepare the public for the idea that ARM is really just a $1.25 billion engine test robot. That’s the actual goal of the redirect mission, apparently: to test the solar ion propulsion systems that will be used to send ships to Mars. These are extremely low-powered engines that apply constant thrust over long periods of time, and because they use primarily energy collected from the Sun, their onboard fuel sources can last a very long time. With multiple engines running nonstop for weeks or months, they can accelerate a ship to very high speeds — though they’ll take just as long to slow it down again at the destination. These have been the assumed power behind an actual asteroid redirection, since it wouldn’t be possible to get the necessary volume of liquid fuel all the way to the rock. If the solar engines work, NASA will view the mission as a success — but I’m not sure how the engines could work, and we don’t end up with the asteroid they were supposed to acquire for us. If we don’t have the asteroid, wouldn’t something have to have failed, by definition? What Can We Do If an Asteroid Threatens Earth? Trail of the object that exploded over Chelyabinsk, Russia, in 2013. What should humanity do the next time a space rock threatens Earth? European officials recently spent two days figuring out possible ways to respond to such a scenario, with the aim of drawing up effective procedures before the danger actually materializes. The first-of-its-kind simulation considered what to do if an asteroid similar to, or larger than, the one that exploded over Russia in February 2013 — which was about 62 feet (19 meters) wide — came close to Earth. Officials focused on activities ranging from 30 days to 1 hour before a potential impact. "These include the size, mass, speed, composition and impact angle," he added. "Nonetheless, this shouldn't stop Europe from developing a comprehensive set of measures that could be taken by national civil authorities, which can be general enough to accommodate a range of possible effects." Radar images from NASA's Deep Space Network antenna in Goldstone, California show that the asteroid itself was about 500 feet (150 meters) smaller than expected, and measured about 1,100 feet (325 meters) across. The asteroid's small moon was approximately 230 feet (70 meters) across. The asteroid was already unusual because it was about 10 times bigger than most near-Earth objects, which range from 50 to 100 feet (15 to 30 meters) in diameter. NASA said that about 16 percent of asteroids in 2004 BL86's size category—meaning those that are 655 feet (200 meters) or larger—are "binary," meaning there is a primary asteroid with a smaller asteroid moon orbiting it. NASA has released information on asteroid 2014 BL86, which passed by Earth on Monday, but at least one group is not buying it. The object orbiting around the asteroid is a moon, NASA claimed, but some UFO trackers say that is not the case. UFO Sightings: "Diamond shaped and flat"
The site UFO Sightings Daily, which has over 22,000,000 page views and counting, has examined photos of the asteroid and the object that accompanied it. They wrote that the object was not shaped like a moon but shaped like an alien spacecraft, a craft that had control over how it moved through space. "This asteroid has a UFO flying in orbit around it. We can see from the detailed photo that the craft is diamond shaped and flat," UFO Sightings Daily (USD) writes about the 'moon'. "NASA of course goes on to say that this flat object which does not flip over end is a moon. Wrong! "Any moon this thin would be tumbling end over end. This object is keeping itself steady, flying like a ship would in space." NASA's statement on the object hovering around the half-a-kilometer wide asteroid was considerably different, maintaining that it is a moon in a regular orbit around the asteroid and that such a phenomena is a common occurrence. "In the near-Earth population, about 16 percent of asteroids that are about 655 feet or larger are a binary (the primary asteroid with a smaller asteroid moon orbiting it) or even triple systems (two moons)," NASA said. This subway-car-sized space rock didn’t impact Earth (obviously) on this trip around the Sun and won’t on any of its more distant passes during its 2.9-year orbit in the foreseeable future. And even if it had, it wouldn’t have been the end of the world – but we certainly would have known about it, especially if it had been over a populated area. Based on its size, even without knowing composition, I’m making an uneducated guess of a Chelyabinsk-sized impact event. That didn’t happen. Learn more about 2015 ET’s parameters here, and see more night sky videos from the Crni Vrh Observatory here. *Technically the time of closest approach for 2015 ET was 16:42 UTC on March 10. NASA's Osiris-Rex mission ( www.space.com/21181-bring-some-asteroid-to-earth-osiris-rex-2023-video.html ) has passed a crucial milestone, moving from the design and development phase to the spacecraft-building stage, agency officials announced Monday (March 31). If you wake up in the middle of the night with weird dreams about flying asteroids, I wouldn’t be surprised. Around 3 a.m. (CDT) tomorrow morning April 21, a 50-foot-wide asteroid will hurdle just 0.2 lunar distances or 45,600 miles over your bed. The Mt. Lemmon Survey, based in Tucson, Arizona, snagged the space rock Saturday. 2015 HD1 is about as big as a full grown T-rex through not nearly as scary, since it will safely miss Earth … but not by much. Geostationary satellites, used for global communications, weather forecasting and satellite TV, are parked in orbits about 22,300 miles above the Earth. 2015 HD1 will zip by at just twice that distance, putting it in a more select group of extremely close-approaching objects. Yet given its small size, even if it were to collide with Earth, this dino-sized rock would probably break up into a shower of meteorites. Lucky for all of us, astronomers conducting photographic surveys like the one at Mt. Lemmon rake the skies every clear night, turning up a dozen or more generally small, Earth-approaching asteroids every month. None yet has been found on a collision course with Earth, but many pass within a few lunar distances. A common misunderstanding about approaching asteroids concerns Earth’s gravity. While our planet has plenty of gravitational pull, it’s no match for speedy asteroids. We can’t “pull” them in like some tractor beam. In grappling with the threat of doomsday rocks from outer space, Hollywood has always been far ahead of the federal government, cranking out thrillers full of swashbuckling heroes, rockets and nuclear blasts that save the planet. Now Washington is catching up. On Wednesday, the nation’s agencies that build civilian rockets and nuclear arms sealed an agreement to start working together on planetary defense. The goal is to learn how to better deflect comets and asteroids that might endanger cities and, in the case of very large intruders, the planet as a whole. “Often, these agencies focus on their own pieces of the puzzle, so anything that brings them together is a good thing,” said Bruce Betts, director of science and technology at the Planetary Society, a nonprofit group that promotes space exploration. Comets and asteroids are part of the cosmic rubble left over from the birth of the solar system. Comets, made of dirty ice, visit Earth’s neighborhood only when knocked loose from their home orbits beyond Pluto. That makes their movement somewhat unpredictable. Asteroids, made of rock, fly mostly in a belt between Mars and Jupiter. Their orbits can be calculated with great precision if astronomers can spot the dim objects. Rocky debris rains down steadily on Earth, mostly as dust grains and tiny pebbles. But every once in a while a tumbling giant, miles wide, such as the one thought to have done in the dinosaurs, zooms past the planet. In 2013, this extraterrestrial threat gained new credibility after a 7,000-ton rock — roughly 60 feet wide and technically a meteoroid, smaller than an asteroid — exploded over the Russian city of Chelyabinsk, injuring 1,500 people, mainly as shards flew from shattered windows. The dazzling light from the rocky intruder blinded eyes and burned skin even though the temperature that day was far below freezing. They should use the tractor beam instead. Last I checked, if my memory is correct, the next somewhat close one will be July 6th but It's no threat. These three separate radar images of asteroid 2011 UW158 show how the asteroid was tumbling as it flew by Earth on July 19, 2015. When an asteroid packed with about $5 trillion worth of platinum zoomed past Earth this month scientists were ready, capturing the space rock on radar as it sailed safely by our planet. The asteroid 2011 UW158 missed Earth by about 1.5 million miles (2.4 million kilometers) — a little more than six times the distance between the planet and the moon — during its flyby on July 19. There was never a chance of a collision during the flyby, researchers said. But it was close enough for NASA scientists to create a video of the asteroid from radar observations. Previous studies by Planetary Resources estimated that 2011 UW158 contains about $5.4 trillion worth of platinum, an element that is rare on Earth.